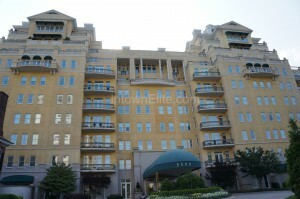 2500 Peachtree is a traditional high-rise condo with a European-inspired architectural style. The building is 10-stories tall and includes about 60 upscale homes in 2, 3 and 4-bedroom layouts with sizes ranging from just under 2200 to just over 7300 square feet. The elegant building is located on an approximately 3-acre manicured lot in central Buckhead, at the intersection of Peachtree Road and Lindberg Drive. Amenities are what you would expect from this class of condominium, 24-hour concierge service, heated pool, fitness center with sauna and massage room, semi-private elevator entrances, reserved covered parking and available guest suites.